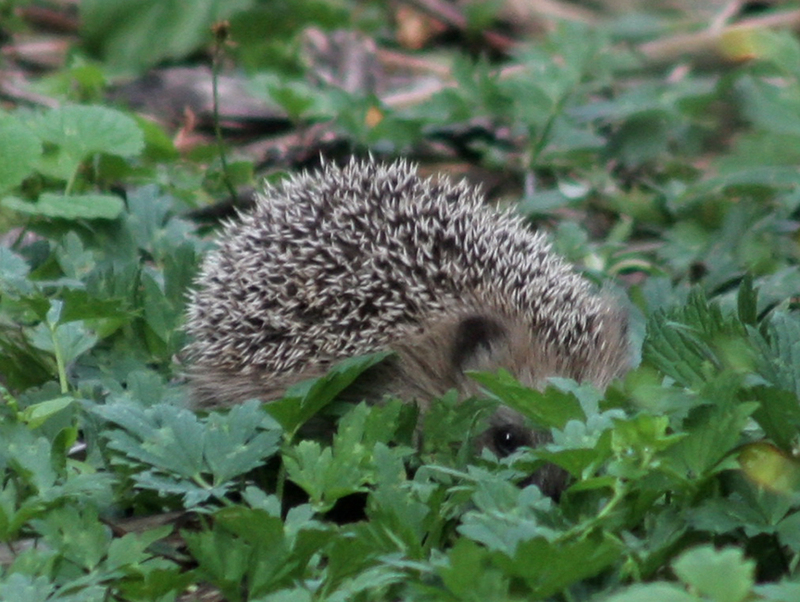 The hedgehog looked up at May with wide black eyes and twitched its nose. It was a tiny ball of brown spines, sitting at the edge of the pavement and staring up at her with something akin to adoration, though the little girl didn’t know why. She bent down to him, expecting him to shuffle away, but instead he sniffed her hand curiously. “Hello,” she said nervously. The streetlights were starting to come on now, and she was late coming back from the shops. She would get into trouble for it, she knew, but she’d spent so long deciding what pick and mix to get – choosing and weighing and taking some out and weighing again until it was worth a pound. Now she knew she should hurry back so he wouldn’t be so angry, but at the same time couldn’t bring herself to face her father’s rage. The hedgehog sniffled at her fingers and licked them. “Can I call you Barry?” she asked, and although he didn’t say yes or no, she decided that he was OK with it. “I have to go now… Sorry.” Another street lamp flickered from pink to orange to yellow above her. Home was only two streets away, so she picked up her satchel back and carried on walking. She was only a few doors away from home when she heard a scuffling sound in the gutter beside her; she looked down and saw Barry waddling through the autumn leaves. Perhaps he understood her words or maybe her tone of voice, but Barry stopped still in the leaves and turned around a few times. He watched her go with mournful black eyes, his nose beneath a crisp golden leaf. May’s father was angry, but her mother was less of a wreck than usual. She took one look at her daughter traipsing in with windswept hair and muddy boots and sent her to her room at once, in a tone that was forceful, but not wholly unkind. She stood between the little girl and her husband, who had been drinking for hours and was already shouting at the slightest thing. As May’s door closed, he began to shout at her up the stairs, and although May could work out some of the words, she did as her mother had said and kept the door tightly shut, then played pop music to drown out the worst of it. He fell silent after half an hour, but when May was called to dinner there was a dark mark on her mum’s face that hadn’t been there before. That night, as May lay in bed, it started again. First her dad yelling, then the crashes and bangs as he threw things – anything that came near to his hand – at his wife. May was too scared to put on the music, so she pulled the duvet from her bed and sat by the window, staring at the sky. “I wish…” she began to say, but the world was too big and too scary and too bloated with unfulfilled wishes that she suddenly didn’t know what to wish for. Should she wish for her dad to stop drinking? Would that make it better, or worse? How would she know? Or maybe she should wish for him to go away again… But when he did that before her mum had sat hunched over the kitchen table for days on end, crying into her wine, pulling May onto her lap and phoning him over and over again to tell him how much she missed him and they needed him back. Did she really want that? “I wish Barry would come back,” she said, and looked down into the garden. The kitchen light was on, flooding the yard with light, and there besides a flower-pot was… No, it couldn’t be. She squinted down at the flower-pot, trying to make out the dark shape beneath it. The noises from downstairs faded to nothingness as she struggled to identify whether that shadow was really her friend, or just a trick of the light. There was only one way to be sure. She threw on a dressing gown over her nightie and stepped carefully out onto the landing. She could hear them arguing again – were they in the living room? She tiptoed down the stairs, placing her feet near to the sides of each step to stop them from creaking. Yes, they were in the living room, she decided, so she kept away from that door, instead stepping into the kitchen where piles of washing up had been discarded only ten minutes ago. As she reached the back door, she heard a crash followed by a sickening “thunk” sound, and then her mother screaming. She peered out into the night. There was the flower-pot – the big one with the poppies – and there he was, smiling his sweet half-smile at her from the shadows. “Barry,” she whispered. The door clicked open quietly and as quick as a flash she was outside in the yard, dropping to her knees to greet the hedgehog. May glanced nervously back at the house. She put down both her hands to the ground and Barry climbed into them, carefully keeping his sharp spines from stabbing at her soft skin. He turned around to face her, his black eyes meeting her blue. Lilith’s ‘A Hedgehog named Barry’ was written as part of a HHC challenge in 2013, however it was such a wonderful short that we raided through the archives in order to bring it to you, our readers and followers, as an Inkblots special Hallowe’en post. Those feelings of uneasiness through the sinister shadow of May’s father really come to light within the final few sentences. Is Barry really a lovely hedgehog? Or is something more horrible happening? Either way, we can’t help breathe a sigh of relief when our fear for May’s safety is finally over. We hope you enjoyed reading Lilith’s story, and have a Happy Hallowe’en!